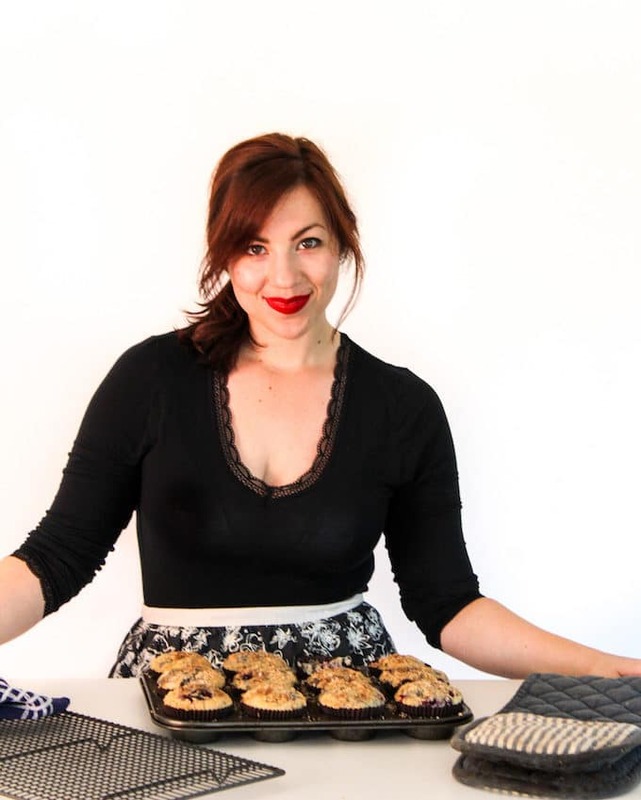 When life hands you overly ripe bananas…..it’s time to make banana bread! That’s how the saying goes, right? Or in this case, buy as many bananas as you can carry and wait until they turn properly spotty so that you can bake to your hearts content. There’s just something so right about sitting down with a slice of banana bread and a cup of tea, ya know? 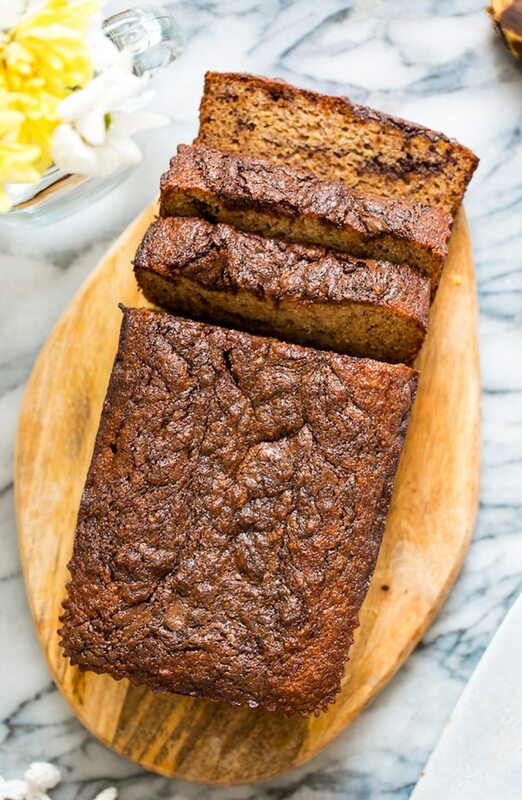 This particular paleo banana bread has been a favourite in our house for a very long time. In fact in was actually one of the first recipes I ever shared here on ASK. So of course the pictures weren’t exactly what you’d call appetising and the written recipe wasn’t all that descriptive. So I guess it’s about time I went back to give this much-loved recipe a little more TLC along with some updated tips and pointers. Let’s get to it! The base of this recipe is super simple – made in one bowl and can be prepped in under 10 minutes. 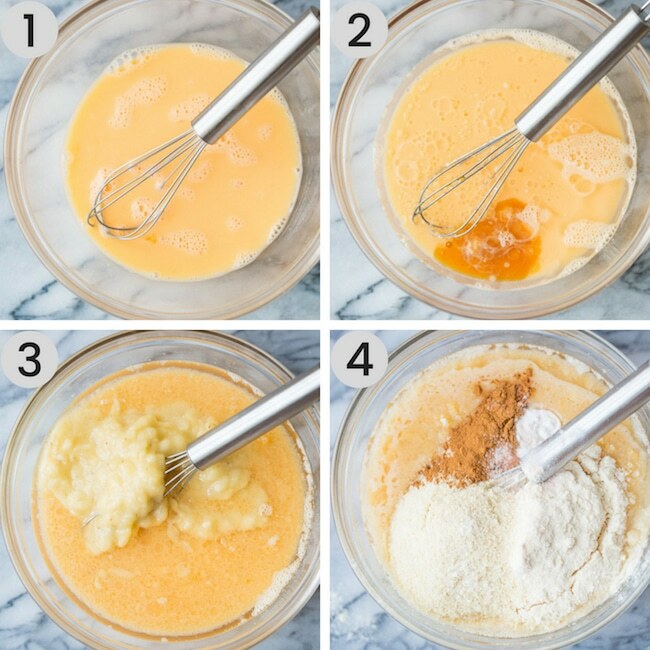 Start out by whisking up your eggs until they’re fully whisked (as seen in photo 1). From there you can begin adding your remaining liquid ingredients including the melted coconut oil, vanilla extract and honey (photo 2) followed by the mashed bananas (photo 3). Finally, just start mixing in the dry ingredients: coconut flour, almond flour, baking soda, cinnamon and salt. You should end up with a thick, somewhat lumpy batter – look at photo 7 below if you need a visual example. So – to be honest the chocolate cinnamon swirl is kind of optional. You can absolutely leave it out and you will still end up with a totally delicious banana bread. You can also just throw in a few chocolate chips, maybe some raisins or mixed nuts and call it a day. All of those options would absolutely be easier and still good. BUT if you’re a total sucker for all things cinnamon and swirly – the extra five minutes here will be worth it! All you need to do is melt a little chocolate and then mix in some cinnamon + sugar (photo 5). 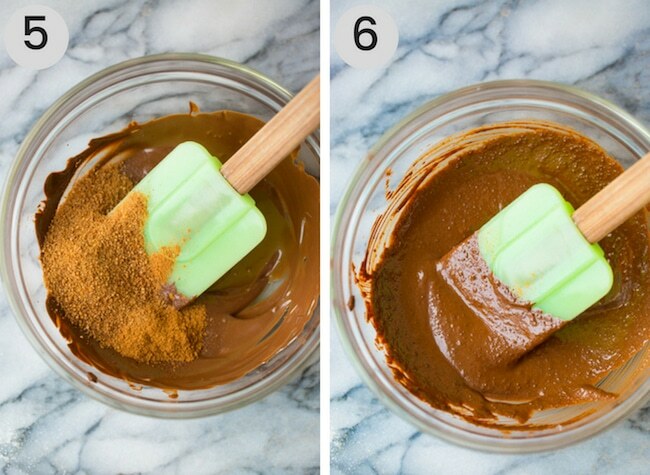 Make sure that you melt the chocolate on it’s own before adding anything else so it doesn’t burn. The final mixture will be a little bit grainy looking/feeling from the coconut sugar (photo 6) and that is no problem at all – no need to mix until it melts in or anything. 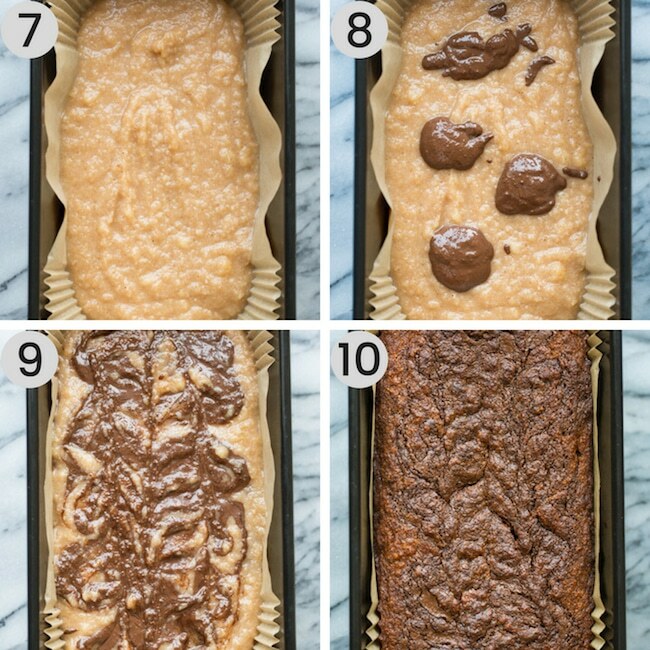 Start out by adding half of your prepared banana bread batter to your lined or greased loaf tin. Then, take small spoons of the chocolate cinnamon mix and dollop a few spoonfuls across the top of the batter. Leave space in between for your swirls. Take a knife or toothpick and drag it across the top to create swirly affects. Then simply add the remaining batter and repeat this process with the remaining cinnamon mix and bake. Easy! How should I store this paleo banana bread? This keeps best when stored in an airtight container in the fridge. Store in the fridge it can keep about 5-6 days. Yes! Wrap it up as tightly as you can in plastic wrap, add it to a large ziplock bag and store in the freezer for up to three months. To defrost just let it thaw out in the fridge over night. I haven’t tried this particular recipe using any other flour blenders however I have had a lot of success recently using tapioca flour in place of almond flour in very similar recipes. I do think a 1:1 sub would work here but I don’t have any recommendations for subbing out the coconut flour. Can I make this without the eggs? I don’t have any recommendations on how to make this particular recipe egg free. If you’re interested in an egg free banana bread you can try this Chickpea Flour Banana Bread (not paleo) or look to this paleo + vegan coconut flour cake for a general egg free cake. And that’s it! 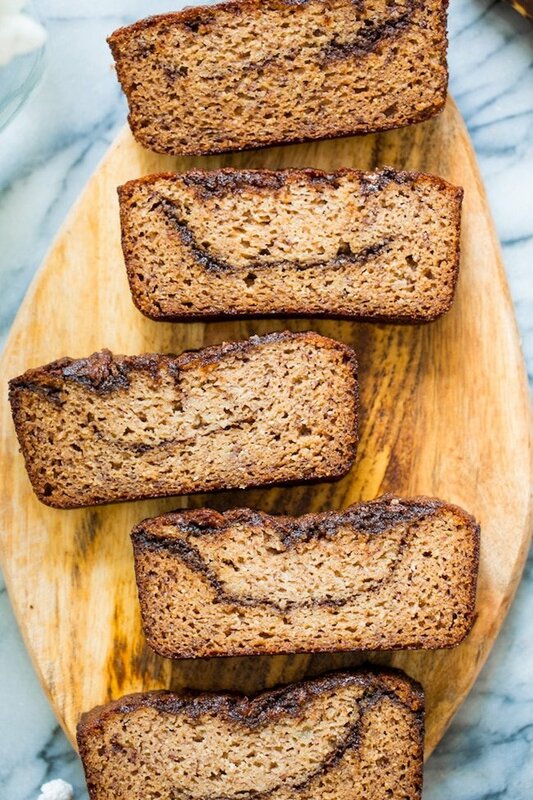 Soft, moist, delicious banana bread. Time to get baking! 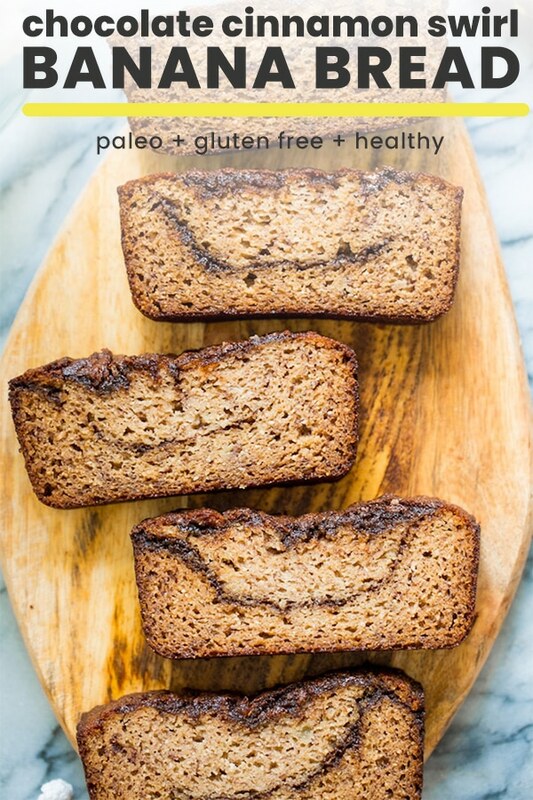 Don’t forget to #asaucykitchen on instagram if you try this Paleo Banana Bread! I love seeing what you make! You can also post your pictures to my facebook page! Preheat your oven to 350°F/180°C. Grease or line a 9x5 inch loaf pan and set aside. Beat the eggs in a medium sized bowl. Add the vanilla, honey and the oil to the eggs, mixing thoroughly. Stir in the mashed bananas. Mix the dry ingredients together in a small bowl, sifting to remove any clumps. Pour the dry ingredients to the wet and mix until well combined. Your batter may be a little lumpy from the bananas. Place the chocolate in a heat safe bowl and heat at 15 second increments to melt the chocolate - make sure to stir in between heating. Once melted stir in the coconut sugar, cinnamon and coconut oil until fully combined. The mixture may seem a little grainy thanks to the coconut sugar. Pour half of the batter into your prepared load tin. Dollop the melted chocolate + cinnamon mixture over the top of the batter. Use a knife to drag through the chocolate mixture to create swirl patters. Pour the remaining half of the batter over the chocolate swirl and repeat with the swirl process. Place in the oven and bake for 40-45 minutes or until cooked through. I haven't tried this particular recipe using any other flour blenders however I have had a lot of success recently using tapioca flour in place of almond flour in very similar recipes. I do think a 1:1 sub would work here but I don't have any recommendations for subbing out the coconut flour. I don't have any recommendations on how to make this particular recipe egg free. If you're interested in an egg free banana bread you can try this Chickpea Flour Banana Bread (not paleo) or look to this paleo + vegan coconut flour cake for a general egg free cake. This was the best paleo banana bread I’ve ever made! My boyfriend who usually won’t touch anything made with banana finished half loaf on his own. Thanks for the recipe! Thanks Britt! So glad you guys liked it! I love banana bread! Yours looks so delicious and moist. Can’t wait to try this recipe! I have tried this recipe twice now and my loaf will not rise?? (But it’s still delicious!!) Any suggestions how to make it less dense? I thought I was over mixing the first time but I made sure not to the second go around!